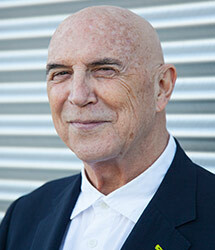 Bruce Willis Ferguson is the president of Otis College of Art and Design, Los Angeles’ first professional arts school. Mr. Ferguson is a recognized leader in the arts, with a distinguished record as an educator, curator, and critic. An accomplished author and curator of dozens of nationally and internationally noted exhibitions, Mr. Ferguson is the founding director and first curator of the nationally acclaimed SITE Santa Fe in New Mexico. He has curated for such eminent institutions as the Barbican Art Gallery in London, the Institute of Contemporary Art in Boston, and the Winnipeg and Vancouver art galleries in Canada. He has also organized exhibitions within the international biennales of Sao Paulo, Sydney, Venice, and Istanbul. Mr. Ferguson’s extensive academic leadership experience includes roles as Dean of Columbia University’s School of the Arts, Founding Director of Arizona State University’s F.A.R. (Future Arts Research), and Dean of Humanities and Social Sciences at the American University in Cairo, Egypt. In 2006, he was awarded an honorary doctorate by the Kansas City Art Institute in recognition of his leadership in the arts.